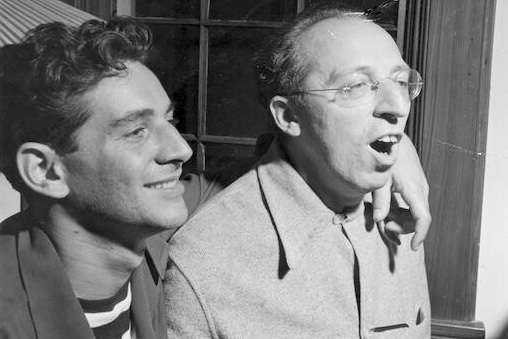 On November 14, 1937, Harvard undergraduate student Leonard Bernstein was attending a dance recital where he happened to be sitting next to Aaron Copland. Because November 14 was Copland’s 37th birthday, he invited everyone on the front row to a party after the recital. At the composer’s request, Bernstein performed Copland’s complex and challenging Piano Variations, greatly impressing Copland and igniting a friendship that lasted more than half a century. 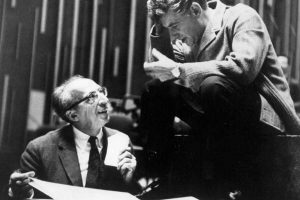 After their initial meeting, Copland became an informal professional mentor to Bernstein, advising him in musical composition and introducing him to his musically elite connections. Copland was also a sympathetic friend and supportive father-figure with whom Bernstein could discuss personal troubles such as his social life, sexuality, and politics. Bernstein and Copland’s personalities complemented each other; while Bernstein was known to be overly emotional and flamboyant, Copland was more reserved and often described as “plain.” Their many differences, accompanied by mutual trust and admiration between Bernstein and Copland, enabled each of them to be the other’s greatest critic. Bernstein gave Copland conducting tips, and was at times brutally honest in his opinions of Copland’s new compositions. Similarly, Copland, the preeminent American composer of his generation, was generous with his time and advice regarding the younger composer’s compositional efforts. Clara Hare-Grogg is a senior at Davidson College where she double-majors in music and anthropology. Clara studies violin with Joseph Meyer and serves as the concertmaster of the Davidson College Symphony Orchestra. In 2018, music lovers everywhere are celebrating the centennial of legendary artist Leonard Bernstein. To help give our listeners a deeper dive into Bernstein’s life and musical genius, we have partnered with Davidson College students in Professor Bill Lawing’s seminar on Leonard Bernstein to produce a blog series sharing details about Bernstein’s family, career, friendships and more. This intimate look at Bernstein’s personal life is a part of that series. Click here for additional blog posts highlighting different aspects of Leonard Bernstein’s experience. Please consider also joining us for a production of Bernstein’s Mass at the University of North Carolina School of the Arts on Sunday, September 30th at 3 p.m. at the Stevens Center in Winston-Salem. A private reception for WDAV listeners will follow the performance. For more information, visit our webpage here.